At least 6 people are injured after a vehicle crashed into a Beef 'O' Brady's restaurant in Spring Hill on Tuesday. 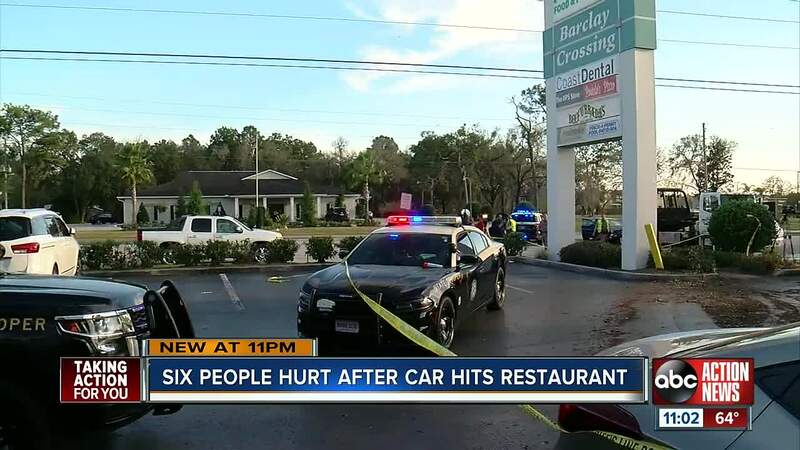 SPRING HILL, Fla. — At least six people were injured after a vehicle crashed into a Beef 'O' Brady's restaurant in Spring Hill on Tuesday. 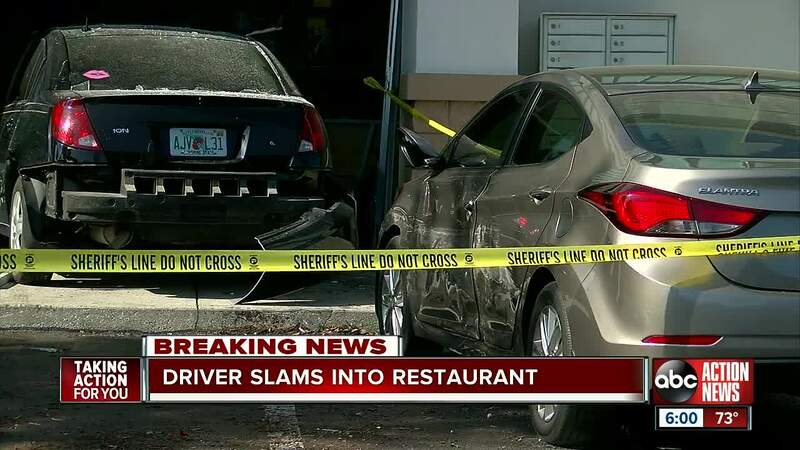 On Friday, the Florida Highway Patrol says they completed their inspection of the car that crashed into the restaurant and determined that the car's brakes failed. The driver, Barbara Markowski, 65, of Spring Hill, was ticketed for unsafe and improper equipment. Troopers released surveillance video of the incident on Thursday. The Hernando County Sheriff's Office says Markowski lost control of a 2007 Saturn sedan. It left the roadway, traveled onto the shoulder, through a flower bed, side-swiped a Ford F150 towing a trailer and continued through the parking lot. 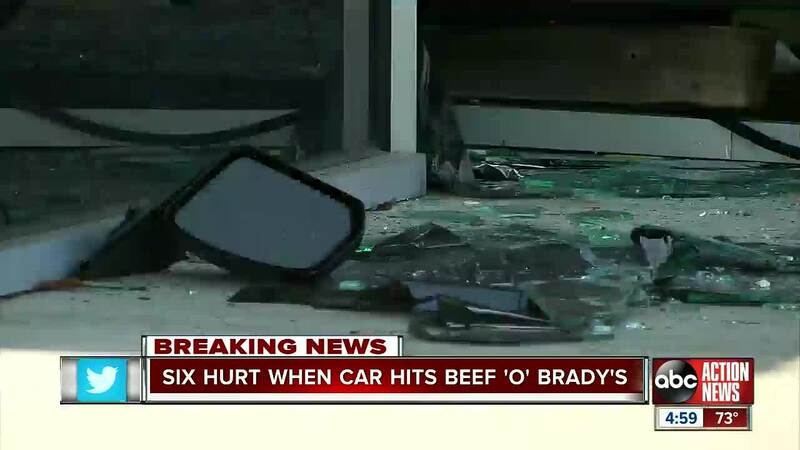 It then struck a parked car, collided with the front of Beef 'O' Brady's, completely entered the restaurant and collided with five adults inside. Six people, including the driver and five customers, were taken to nearby hospitals, including one trauma alert patient who was airlifted from the scene. “Very blessed, very blessed. I’m hoping for the best for everybody else, too," said Kristine Boggs. Boggs was sitting next to the window when the car came barreling through the restaurant. "I'm lucky to be here," said Boggs. The other five people who were transported to the hospital were Kristine Boggs, 65, Stephen Grecco, 84, John Bost, 86, Jovite Palardis, 70 and Nancy Nelson, 68. The restaurant is located at 14387 Spring Hill Drive in The Barclay Crossing Shopping Center. Owner Linda Wolfe hopes it will reopen by the end of the week. What caused the driver to lose control of the vehicle is still under investigation. The Beef O' Brady's opened again on Thursday.